The 1989 TYCO product catalog is a 138-page full-color 8 1/2" x 11" effort that includes 14-categories. Pages 4-31 feature TYCO's R/C Radio Control items; the Dino-Riders take pages 32-47; R/C sports are on pages 48-51; Sega-licensed Pocket Power toys are on pages 52-55; Electric Racing cover pages 56-71; the dwindling HO-scale Electric Trains take up only pages 72-83; the Lego-like Super Blocks are on pages 84-101; Stomper toys take pages 102-103; Soft Toys are on pages 104-111; Dolls are found on pages 112-115; TYCO's Super Dough items are on pages 116-121; Real Food & Play Food cover pages 122-127; Mini Dolls are on pages 128-133; and Electronic Toys end the 1989 catalog on pages 134-138. As mentioned, TYCO's HO-scale Electric Train line continues to shrink in size for 1989. Out of the eight train sets featured, three are of the Turbo Train variety. 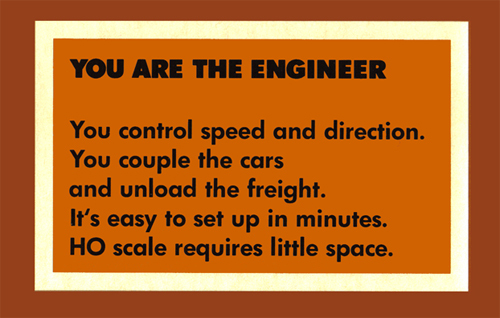 One even rides on slot car tracks and stretches the definition of trains...even for TYCO. 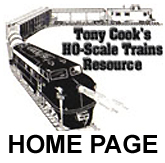 TYCO lists about a dozen Train Accessories including Horse Car and Depot Set (#869); Giant Operating Crane (#950); Piggyback Loader/Unloader (#903); 33 pc. Bridge & Trestle Set (#909); Tycoscene Layout Board (#7940); Turbo Train Loop Track Set (#7901); Electronic Sound of Steam in 50' Box Car (#957); Operating Floodlight Car (#346); Operating Crossing Gate (#908); Tyco Pack (#895); and Track Layout Expander (#7903B). The Track Layout Expander box is pictured with the same early '70s looking family, who seem a bit out of time and place in this 1989 catalog. TYCOKITS for '89 included 23 different items: Furniture Store (#7774B); Drug Store (#7772B); Fruit Store (#7797B); Barber Shop (#7771B); Used Car Lot (#7796B); School House (#7775B); General Store (#7798B); Movie Theatre (#7799B); Pizza Hut (#7724B); Burger King (#7725B); Baskin-Robbins (#7731B); 7UP Plant (#7727B); Howard Johnson's (#7754B); Freight Station (#7785B); Crossover Signal Bridge (#7767) Machine Shop (#7764); Firehouse (#7789); Signal Tower (#7768); Water Tower (#7769); Truck Terminal (#7758B); Exxon Station (#7757B); Arlee Station (#7761). A dozen Freight Cars are included: Stock Car Laramie (#312H); 50' Box Car Santa Fe (#339A); Skid Flat with Culvert Pipe Great Northern (#342D); Tank Car Texaco (#315A); 50' Box Car Burlington Northern (#339E); Hopper Car Union Pacific (#344E); Tank Car Coca-Cola (#315L); Gondola with Culvert Pipe Union Pacific (#341B); Hopper Car Conrail (#344H); Reefer Swift (#329A); Gondola Burlington Northern (#341G); Billboard Reefer Baby Ruth (#355C). The 3-Car Turbo Train (#7900) is listed as a separately available item above TYCO's six Diesel Locomotives: Shark Nose Rock Island (#222-10); GP-20 Burlington Northern (#228-17); Alco 430 Virginian (#235-79); F-9 Chessie (#224-03); GP-20 Santa Fe (#228-21); Alco Super 630 Santa Fe (#250-21). Finally, a set of four Steam Locomotives are featured in the 1989 catalog: Consolidation & Tender 2-8-0 The Royal Blue with Smoke (#245-02); Steam Loco & Tender 0-8-0 Chattanooga with Smoke (#256-15); Steam Loco & Tender 0-6-0 Southern (#257-76); and Steam Loco & Tender 0-6-0 Western Maryland (#257-77).